Upcycling is transforming something worn out or worthless into something better or new. It's the art of turning trash into treasure. When you upcycle a dresser, you can do a cosmetic makeover or repurpose it for a completely different use. Here are 25 ways to upcycle your dresser. Sometimes you only need a pretty paint job to update a dresser. That's certainly true of this sweet vintage piece by Orphans With Makeup. The shape is refined enough for a formal space, but the beachy-blue color makes it equally ideal for cottage and coastal interiors. Upcycling doesn't get any better than this yard sale dresser turned beverage station. The finished bar includes cutouts to keep bottles in place and a trough for icing down drinks. The creators at Bliss Ranch use it on their patio during parties, but it would work equally well indoors, as a home bar or in the kitchen as a coffee station. Give a simple dresser instant style by adding decorative nailhead trim. For straight-line designs, you can opt for easy-to-install nailhead-trim strips. Even better, use individual upholstery nails to create a shape. This lovely nailhead vanity design by Girl in the Garage that spans the drawer fronts. This rolling tool cabinet beauty by Crafty Nest beats a boring metal tool chest any day. Given turquoise paint and sleek new hardware, this weathered chest of drawers it is pretty enough for indoor use. The side handles and wheels make it easy to roll from place to place. At some point in its history, this antique chest was refinished with a ​thick stain and varnish that hid the wood's natural characteristics. When Saw Nail and Paint's Susan stripped it, the grain regained the starring role. The navy paint on the case adds interest and draws the eye to the restored drawer fronts. The flat-file drawers in antique dental, map, and specimen cabinets are gorgeous, but the pieces are pricey. Kristine from The Painted Hive got the look for lots less. She started with a three-drawer laminate chest, the kind you have to assemble. With new drawer fronts, label pulls, and a chalkboard-paint finish, it's unrecognizable now and has ​faux specimen drawers. Need an inexpensive desk? In My Own Style's Diane made a secretary-style version out of a small chest. In addition to its drop-front work surface, it has a tray top and drawer fronts that look like a card catalog. Though this piece started out as an IKEA Tarva, you could upcycle a thrift store or yard sale chest as well. This ship silhouette is both subtle and striking. The good news is that you don't need stencils or freehand skills to do something similar. The mother-daughter duo at Canary Street Crafts teaches two easy methods to transfer large-scale graphics onto furniture. If the height is right, an upcycled dresser makes an excellent television stand. After painting this beauty a bold blue, Just a Girl and Her Blog's Abby removed the two top drawers to make space for media components. The result is stylish and functional. This thrift store chest had a drab brown finish when Confessions of a Serial Do-it-Yourselfer's Christy spotted it. Though it looked lovely with a creamy new color (a DIY chalk-finish paint), Christy decoupaged fabric onto the drawer fronts to elevate the piece to showpiece status. After painting this Craigslist chest navy and adding a protective topcoat, Modern Mountain Life's Katie and Eric didn't finish it with store-bought hardware. Instead, they made their own DIY copper drawer pulls out of copper pipes and fittings. The finished look says high end, not hardware store. Upcycling an old dresser is a great way to avoid paying big bucks for an uninteresting bathroom vanity. Fern Avenue's Lynn restyled this piece with corner appliques, fresh paint, and glaze before calling a plumber in to hook it up. The lettering gives it a fun, quirky look. This antique chest has a great shape and its new charcoal-gray paint makes it look super sophisticated. The real star, however, is the mix-and-match hardware. Number Fifty-Three's Angela chose pulls with similar finishes and shapes, so the mix doesn't overwhelm the piece. It's still formal, but it's fun too. Have a little one who loves LEGOs? This upcycled dresser project from My Repurposed Life's Gail is a must see. She sawed a dresser in two and turned the lower part to into a LEGO-inspired play table. She used leftover drawers to make a matching pair of storage stools. O'verlays are paintable fretwork panels designed to add raised detail to furniture surfaces. Sarah Hearts gave this IKEA Malm dresser a serious style boost when she added O'verlays to some of the drawer fronts. Her tall, narrow chest got a matching makeover. Placed together, they look like a single piece. If you don't need another dresser, you can turn it into something else. In this case, a DIY kitchen island by Number Fifty-Three. The finished island has fresh paint, a shelf to replace the bottom drawer, and a roomy new top. The latter's overhang is supported by painted-to-match wooden brackets. 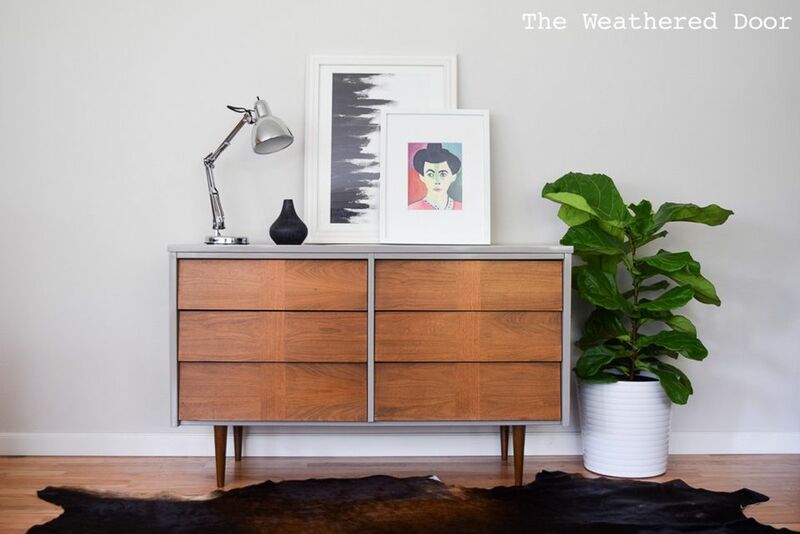 This mid-century dresser desperately needed a makeover. Reeves from The Weathered Door honored its modern shape by keeping it smooth and sleek. After refreshing the wooden drawer fronts, she used high-gloss gray lacquer on the frame. This hall table was a drab and dated yard sale dresser before its astonishing makeover. After some impressive work with a jigsaw and lots of prep, My Repurposed Life's Gail gave it a painted finish in denim blue. A new set of cup pulls finish the look. Some rooms (and tastes) aren't suited for big, bright pieces of painted furniture. That doesn't mean you have to stick with neutrals. Just use the brights sparingly in strategic places. The placement of the bright green paint on this beautiful old dresser by D.D. 's Cottage and Design is an excellent example. Instead of overwhelming the piece, the vibrant color pops against the gorgeous wood of the drawer fronts. If your bathroom needs more storage space, upcycle an old chest. The Salvaged Boutique sisters removed the top three drawers from this piece before lining the inside back with fabric. Now it's the perfect place for stacked towels and pretty perfume bottles. The bottom drawers remain intact for stashing bathroom stuff that's best unseen. You don't have to be a sketching whiz to add a design to a dresser. You just need a good idea and a stencil. DeDe from Designed Decor decorated this antique piece with a stenciled leaf motif that spans the drawer fronts. You'd never know this roomy desk started out as dated triple dresser. Thrifty and Chic's Alicia removed two rows of drawers and their framing to create the ​kneehole. Creamy white paint, new pulls, and a new top with an overhang finish the piece. Becky from Beyond the Picket Fence gave this tired chest a rustic industrial makeover. She covered the drawer fronts with lathing strips for a planked look, and then replaced the pulls with big, heavy-duty handles. If you favor a modern, Swedish-inspired space, you probably have lots and lots of white. That doesn't mean you can't use color for your dresser makeover. You can if you keep it light and fresh. Sarah Hearts got it just right with these pastel-painted scallops. Confessions of a Serial Do-it-Yourselfer's Christy found this antique Empire dresser in a thrift store. She left the two top drawers natural and painted the rest. Then, she decoupaged fabric onto the inset side panels. The result is a charming finish mix.